This retreat is perfect for all level students. It provides private coaching to develop your martial arts skills. Brazilian Jiu Jitsu is one of the most effective self-defense martial arts while Muay Thai is among the most lethal in striking. Develop your grappling and stand up skills as well as scoring an awesome work out session! 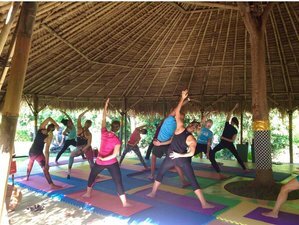 You will also be given yoga classes, sport massage, and surf lessons during the retreat. During the retreat, you will be staying in Mondo Surf & Lifestyle Village. Its a unique surf and yoga resort nestled between the beach and the rice fields of Canggu. Neighbor to one of Bali's best surf spots, you are just a few minutes away from the beach. This room has 2 bunk beds and sleeps 4 persons. Perfect for the lower budget crowd. It is big and super comfortable. Sheets and linen are comfortable and clean. The bathroom is open to the outside so youll feel like you are in the tropics and there is always breeze passing through. Individual safety storage area is available and there are also TV and DVD player set for the relaxing times. There is a mini fridge inside the room for personal usage. Decoration with surf photography to inspire future adventures. The Batur room sleeps 2 persons in one bunk bed. Equipped with TV, DVD and a mini fridge, this room is perfect to share with someone while still maintaining some privacy. There is a comfy en suite toilet and shower with comfortable and clean towels. The room faces a beautiful garden with a glimpse to the pool. The bedding and linen are changed regularly, keeping high standards of hospitality for a budget price. Individual safety storage area is also available. In a beautiful traditional Balinese building, these rooms have at their entrance a lovely balcony facing the bar and pool. A Caribbean hammock sits right in front for the lazy times. Both room have a queen bed and a single bed, sleeps 3 persons. Nicely decorated with a traditional touch and European comfort standards, it makes you feel like you are in Bali while enjoying first class accommodation. The bathroom is huge with a bathtub, shower and private toilet. A safety box and mini fridge are available as well as AC and TV / DVD. Nice private bungalow with one queen bed and two single beds. Perfect for families or bigger groups of friends looking for some extra comfort and privacy. The bungalow has its own private balcony with seats and a Caribbean hammock overlooking the garden and pool. The decoration is impeccable and the toilet has a bathtub and shower. Clean towels, linen and comfortable beds are waiting for great nights of rest after all the day activities. The room has AC, mini fridge, safety box and TV / DVD. This private wood bungalow is Mondos most exquisite accommodation. Feel the wood warmth and relax on a 2-deck private balcony overlooking the small river and tall trees that surround the resort. This is the tropical place everyone is talking about. With a Queen bed and Single it sleeps maximum 3 persons. The room is equipped with AC, safety box, TV / DVD, mini fridge and private toilet. The towels are cozy, beds are comfortable and the linen is fresh. Start your day listening to nature in our morning yoga session. Awaken the body and mind with a combination of Ashtanga style with Vinyasa flows. The class is adapted to please every level of practice and everyone is welcome. A vibrant smile after class is guaranteed. The yoga session starts at 07:15 a.m. until 08:30 a.m. followed by out tasty breakfast options. After a day of surfing, Muay Thai, and adventure come chill out with a relaxing afternoon yoga session. This restorative class combines long-held Yin stretches with graceful slow flows and transitions, specifically targeting the muscles used while surfing. All poses are done from the floor (no standing postures), making this a relaxing, meditative class, perfect for increasing flexibility in a passive, restful way. The yoga session starts at 17:15 until 18:30. During this retreat, you can choose to do yoga once or twice daily (morning or afternoon session). This retreat will take place in Canggu, Bali. Canggu is not only trending for its stunning waves and beaches but for its fun nightlife, great restaurants and a vibrant coffee scene. There is a hipster, yogi-ish side to it hard to ignore and totally irresistible. Its not far from Balis best tourist attractions yet distant enough to have an atmosphere of its own, certainly the place to be at the moment. During the retreat, you will be served seven healthy breakfasts. They have a delicious food menu with Indonesian and international treats available until 8:00 p.m. Bar service is available from 2:00 p.m. onward. The barman is serving delicious juices, cocktails, wine per glass and tasty coffee from a brand new machine. Please book your flight to arrive at Ngurah Rai International Airport (DPS). Mondo Lifestyle Resort will pick you up from the airport. The pick-up is included in the price. Mondo is a unique surf and yoga resort nestled between the beach and the rice fields of Canggu. Neighbor to one of Bali's best surf spots, you are just a few minutes away from the beach.